o you think grocery stores lined up the most frequently purchased items at the back of the store for no apparent reason? Allows you to manage all of your affiliate links across all of your domains from one easy to manage control panel! 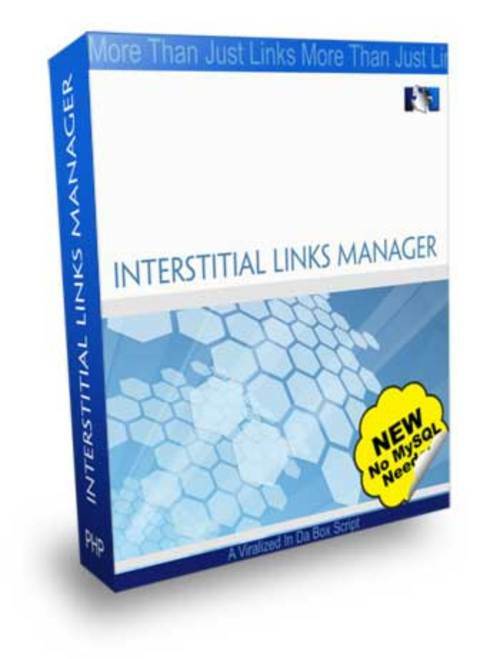 Here's How Interstitial Links Manager Work! Do not underestimate the simplicity of the image above and dont be fooled by similar or other products on the market that claim to provide you with similar results, because theres simply no other product available today that can match or out perform the results youll receive once you say yes to the Interstitial Links Manager. With this deal, you can only gain by getting a copy now! Yes Jahn! I Have Read The Terms Of Acceptable Usage And I Just Have To Have This Software! It's Hard To Go Wrong When You Only Invest A Tad Tiny $24.95 On A Powerful Script Like This! Can't find the order button? Try viewing this page with the award-winning Web browser from Mozilla which is now faster, even more secure, and totally customizable to your online life. Click here to download your free Firefox Internet Browser now! P.S. We want you to feel proud for this purchase because we know the value of this solution offered. Get the script right now (just click the link below) and start using it. If you're not thrilled just ask for your money back. P.P.S. You have 30 days to decide if this solution is THAT good as described here or not. If at any time in thirty days you decide this script was not what you needed then you will get your money back asap. No questions asked at all. Own this fantastic, powerful, thorough solution today!